Liczba stron: 39 Jest to ujednolicona liczba stron, która ułatwi Ci porównanie długości książek. Każda strona Legimi to 200 słów. Master Texas Hold’em Poker for Fun and Profit!In Texas Hold’em, players compete against each other – not just the dealer (as in other casino games). This popular and exciting game offers many profitable opportunities to smart, savvy, and educated players. Take the plunge and start your Texas Hold’em adventure today!Poker: How to Play Texas Hold’em Poker will welcome to the poker table with everything you need to win big – from the most basic elements of the game to advanced strategies for increasing your winnings. You’ll find out how to navigate the various seats at the Texas Hold’em poker table, play the game like a pro, and avoid the “never ever” mistakes that trap so many other beginners. In no time, you’ll be winning big, feeling great, and raking in the chips!Before you sit down at the table for the first time, make sure to spend time with your copy of Poker. You can make the most of your investments, learn to read the table and your opponents, and separate poker myths from poker facts. This complex and exciting game has many nuances details to enjoy – including the subtle art of reading other players. Develop your poker face, learn to avoid your tells, and give your opponents a run for the money by “reading their minds” and playing your hand to the greatest advantage! Welcome to the Poker Table! 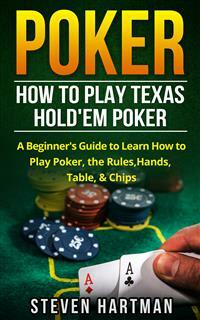 How Did Texas Hold ‘Em Become SO Popular? Chapter 1: Welcome to the Poker Table! FROM THE CELEBRITY TOURNAMENTS ON cable TV to the games played at home nationwide, poker can be filled with fun and suspense. Poker Machines – Variations include five-card draw, Joker Poker, Deuces Wild, and dozens of others. Three Card Poker – A popular version played as part of the table games, this version combines the excitement of poker with the speed of table gaming. confusing at first to learn, but the dealers and players are generally very helpful. It is an exciting game often with lively conversation. Texas Hold ‘Em – Recently becoming one of the most popular games in the casino, unlike other casino games, this one focuses on the players gambling against one another; not just against the dealer. Texas Hold ‘Em has similar rules to regular poker or five card draw, but the cards are dealt differently, and there are more opportunities to bet. There is a diverse atmosphere to the Texas Hold ‘Em tables, and no two will be alike (unlike Blackjack where everyone wants a Blackjack or, at a minimum, for the dealer to bust). Some poker players play as seriously as if it were the World Series of Poker while others pop in out of curiosity and try their luck at a few hands. CasinoTexasHold‘EmisadifferentballgamethanaSaturday night poker tourney with pizza and drinks. I’m not saying it isn’t fun or that people don’t chat and have a good time, but just like the serious gambler at any table in the casino, there are players who have zero interest in talking and play with a straight poker face the whole time. So, being one of the only games in a casino that pit players against players, and since there can only be one winner per hand, the spirit of competition is alive and well. This book is designed for the beginner who has always wanted to sit at the oval Texas Hold ‘Em table at a casino and understand the concept of the game but was too timid to try or wasn’t sure how to play poker.